What is your home worth in today’s market? Click the following link to find out. 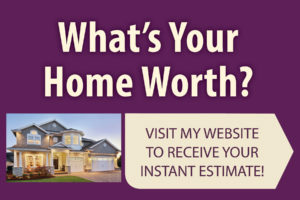 This is a quick and easy way to find out what your home is worth. You do not need to be ready to sell your current home. Fill out the information on my website and get your free Home Valuation. The real estate market is still facing a shortage of active listings for sale. We are in what is considered a sellers market. In a balanced market there is 5-6 months of active listings for sale. Hence we have prices paid for homes going up and a lot of frustrated buyers who can’t find a home to purchase. I apologize to all my readers that I have been missing in action. I have been reinventing my real estate business so that I can offer you superior customer service in the greater Seattle area. Whether you are buying or selling, you can expect from me the best customer service you could ever receive when it comes to your real estate needs. Whether it is getting your home priced right in today’s market to sell quickly, marketing your home online, keeping you informed of all aspects of the selling process, to getting your home through escrow and getting the sale finalized, I am there every step of the way. For home buyers, you can expect that I will help you get the best price for the home you want to buy without having you pay above market value. Keeping you informed of every step in the home buying process. From mutual acceptance to final closing. I will be there for you during the home inspection, and even during your signing of closing documents, to the final closing when you get the keys to your new home. Here is some rate information you may find helpful. Talk to your loan officer to find out what rate you can get today or even tomorrow. Hurry while rates are still low. A leading indicator of future nonresidential construction spending hit a seven-month high in September, lending weight to construction forecasts calling for a greater-than-expected 17% boost in commercial construction next year. Are your properties being fully utilized? Have you maximized profits on the properties you already own? If you cannot confidently answer yes to these questions then continue reading. I have a thriving Floral Business Opportunity for sale in Des Moines, WA. It is a well established business with several floral contracts in the book for later this year. Owner will be willing to train the right person. Please bring your offer as the owner will entertain all reasonable offers.